1. Chihiro and her family move to Tochinoki where their new house will be. What color is their house? 5. Haku takes Chihiro into the fantastical bathhouse to help her find her parents. As they walk in, what does she do to avoid getting caught? 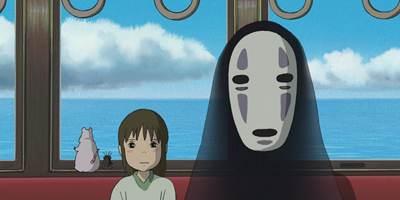 6. Who is the first to discover Chihiro's presence? 9. Chihiro makes it to Yubaba’s office and which part of the door talks? 11. “Meet me at the bridge. I’ll take you to your parents.” Chihiro’s (or Sen I should call her from now on) sleeping cover has a _______ pattern. 12. Sen meets her first customer, an unnamed stink spirit that’s formed from a pile of trash. Which is not part of that pile? 13. It turns out the stink spirit is not what it seems. Instead, it is a _____ spirit. 14. What does No-Face give to Aogaeru before it consumes him? 16. Who does No-Face consume next? 17. Sen hides out in Boh’s bedroom to find Haku. Which is not one of Boh’s toys? 19. Why does Zeniba arrive to Yubaba’s office? 20. Zeniba’s golden seal has this animal on the top. 21. Sen wants to bring the seal back to Zeniba at Swamp Bottom. How will she get there?